If you’ve cruised the internet for any length of time, you’ve undoubtedly seen at least half a dozen videos where police officers have mistreated normal citizens and lost their jobs in the process. We at OnePageNews would like to heighten your awareness to a flaw in our attempt to create a law enforcement mechanism. Without trying, we’ve created an acidic dysfunctional system that breeds jaded hatred within the souls of our officers. We believe the solution is not more police, but more distribution of responsibility within society itself. Centuries ago, man lived in smaller communities. Communities that lived with central authorities, but that held within their own means the ability to defend themselves with predetermined laws by which man could act to localized justice. Men combined their collective efforts to act as judge and jury to ensure that balance was kept less one might find themselves being judged unfairly themselves. The law of the jungle was replaced with fairness laid down by the people. The same people who forced King John to seal the creation of Magna Carta; the document that led the way to the Constitution of the United States. It is safe to say that save some elite driven mass extinction, man will never return to villages and tiny towns that can be run by a single sheriff or community of volunteer lawmen. Let’s examine today’s problem first. Today our law enforcement agencies are massively centralized. This has inadvertently led to a phenomenon that is compressing the most acidic behaviors of man into the responsibility of a few souls that have dedicated their lives to serve and protect. Initially, this seems like a logical idea. The cadet goes through training and is excited to honor his community. He or she graduates and enters the workforce and is immediately struck with the reality of their position: they are to handle every moment of human demise until retirement. Each law enforcement officer goes through the typical stages of thinking that they’ll be able to handle the onslaught of challenges presented by the job, but the truth as revealed by hundreds of cases a year world wide is that no one does. Police officers are merely humans that have taken on the noble burden of protecting others under the rules laid down by law. However, they quickly discover the constraints of following the law against criminals that don’t. Every race, every gender, every crime that can be committed is encountered on a daily basis, thus shaking the very foundation of every officer’s faith in man. Eventually, that officer cracks, and this tipping point is being achieved at a faster rate than ever before. The United States of America averages 256 law enforcement officers per 100,000 citizens as of 2010 data. This means that one police officer is responsible in theory for 390 citizens. Given that most citizens are law-abiding individuals, thankfully these numbers reduce greatly when it comes to actual face-to-face confrontations. However, even if one violator threatens the life of an officer once a week, the officer still runs an accelerated risk of developing a dysfunctional attitude in their attempt to sustain the peace. This solution of assigning the few to guard the many is breaking down. Our officers are unable to endure the routine disrespect that so many criminals dish out because they know there aren’t enough police to deal with the ratio of crime verses police. This is why we need a change, and it isn’t to become a police state. In the United States of America we have something called the 2nd Amendment. This amendment was designed to keep our population safe from tyranny, and as a secondary provision to keep our country safe from criminals of less intent. Today the idea of a nation wearing sidearms appalls many, although it shouldn’t. It has been said many times by folks who’ve actually fired weapons that an armed society is a behaved society, and this is where we’d like to seed your mind with a new vision for law enforcement worldwide. Imagine if you will, a society where behaving was the norm. Where criminals would fear any act against their fellow-man, because every single adult would have the right and incentive to bear arms. The days of liquor store robberies would reduce to as close to nothing. The idea of being shamelessly rude in public would no longer be a mainstay of dealing with one’s internal problems. Bars would no longer offer this oasis for becoming belligerent fools. Regardless of the solution, the mechanism of compressing society’s problems onto a few doesn’t work, and it won’t work regardless of how many law enforcement officers are hired. Society needs to protect itself in a distributed manner. An individual needs to maintain a realistic view of humanity; most are honest peaceful law-abiding individuals, but some, few, are convinced at a young age that the consequences of acting against society are not strong enough to detour bad behavior. We can hear the dissenting voices reading this article. Your fear is that too many people are corrupt today to trust them with carrying a side arm. Too many citizens watch violent movies, and are thus inclined to settle minor disputes with lethal force. There is a risk of this happening, and we’ve indeed seen this behavior in states like Florida where a man shoots another man for texting in a theater. However, as one critic put it, “Rude people are getting rid of rude people.” The man acting selfish against society is murdered, and the man killing him ends up in jail. The two cancel themselves out. We would wager that the man texting in the theater didn’t expect to be drawn and fired on when he assaulted the man with the gun refusing to be courteous. If he understood that eight out ten citizens carry lethal force, his decision to risk his rude behavior would have been tamed. It is our sincere belief that a national movement to externalize all weapons permits to a sidearm status in all 50 states would greatly settle the macho attitudes of citizens that operate under the notion that criminal behavior is a viable way of life. It would also remove the burden on our law enforcement to endure the daily pressures put on them by dealing with the pure aggression being injecting into our civilization by bad economies, war mongering mass media, government propaganda, and other sources. 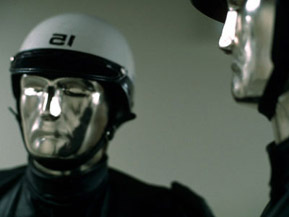 George Lucas’ first film THX-1138 put forth a vision of a world policed by robots. We are most likely 100 years from this entering any level of realization, but rest assured it will come if we allow the currently flawed system to continue. This film accurately portrayed the corruption and nonsensical behavior of hidden forces that let the masses live by robotic policies of behavior through a fascists socialistic world. Gods were reduced to telephone booth AI counseling sessions, while individualism was erased with an undefined need to work in perpetual support of the police state itself. Bottom-line: Man needs to be responsible for himself. Man needs to be fully armed to police his local geographical regions. And should man be faced with a corrupt government or military faction, man should be able to renew those agencies until they meet the requirements laid down by our country’s founding documents.